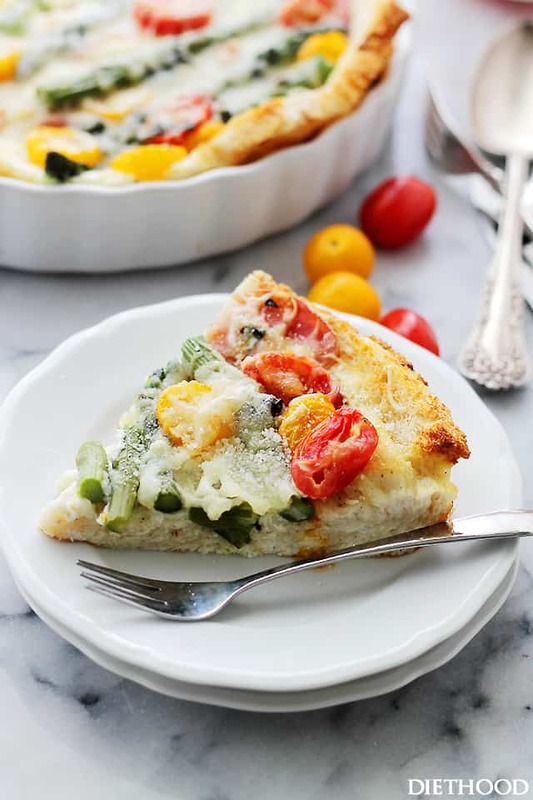 Overnight Breakfast Strata with Prosciutto and Asparagus – This delicious breakfast strata is loaded with prosciutto, tomatoes, and asparagus, and it’s the best way to serve breakfast or brunch to a crowd. Bonus? Prepare it the night before and pop it in the oven the next day! Putting breakfast back on the table! Buhlieve me, once you get a taste of this, you won’t ever want to skip breakfast again. Hi Hi, friends! To those celebrating, have a Blessed Good Friday! Because I’m a big believer in marking all holidays – including Holy ones – with food, I present to you YOUR Easter Brunch recipe! And you are most certainly very welcome! Holy, magical, pure and spiritual Easter coming at us in T-2 days. HOW?! How did it creep up on me so fast?! Note to self and everyone: parenting is hard to do. Note to self and everyone II: cut up the asparagus before placing it in the baking dish. For me it was a matter of pretty vs. practical. I chose pretty, but trust me when I say that all will be happier if they don’t have to bite into a mile long asparagus that ends up hanging outside their mouth. The true reason for this breakfast casserole/strata/ bake/ was that we had tons of asparagus, a pound of fresh prosciutto that cost me a pretty penny from my favorite Italian deli-guy, and a dozen eggs with an expiration date from 3 days ago. 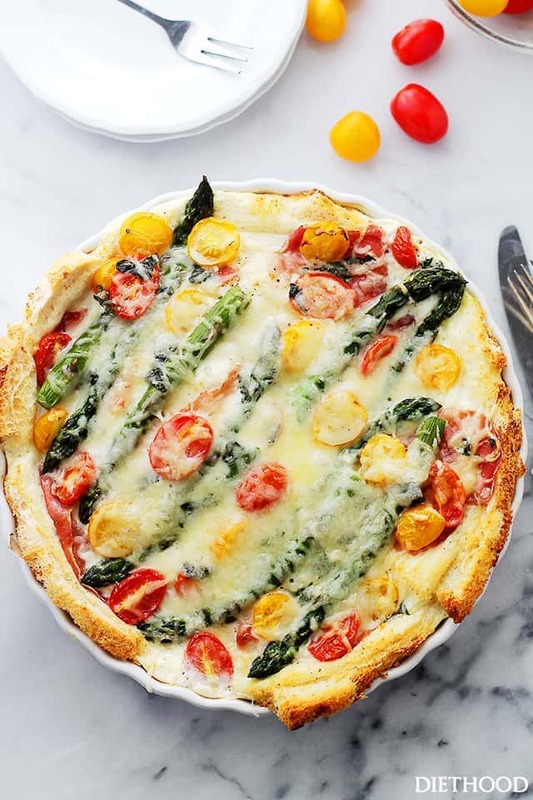 The beauty about this strata is that you can prepare it ahead of time, and it will get all extra flavorful and wonderful while in the fridge, and then just pop it in the oven the next morning. 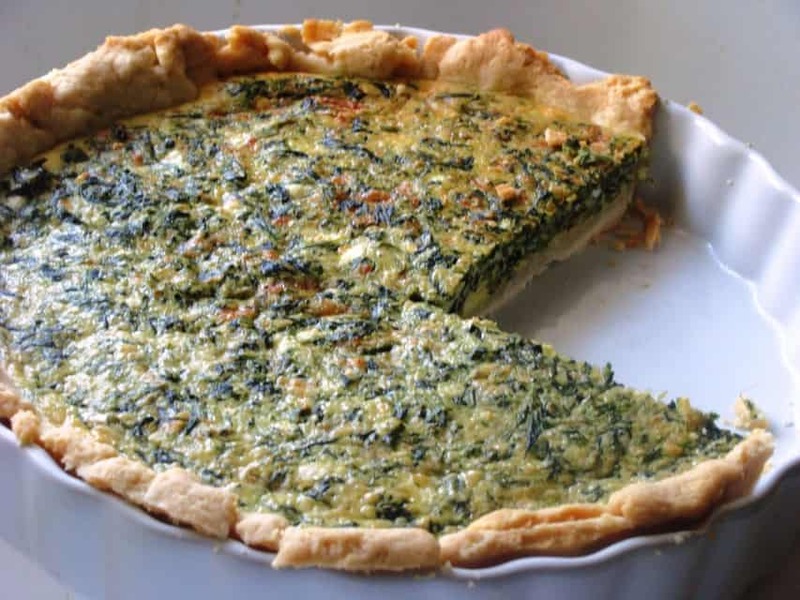 OR bring it to your potluck gathering and bake it there. Or wherever you’re going this coming Sunday. Also? You don’t have to use prosciutto. Ham or bacon will do, as well. If you don’t like asparagus, find another green veggie to go in there. G’ahead. Make it your own. That’s the other beauty about this recipe – you can add whatever fixins your little heart desires. Just, make your mouth happy! Lightly grease a 11-inch deep pie plate with a pat of butter, OR you can also use a rectangular 2.15-quart baking dish. Arrange the slices of bread on the bottom of the baking dish, allowing some edges to hang over the sides. Layer the prosciutto over the bread slices. 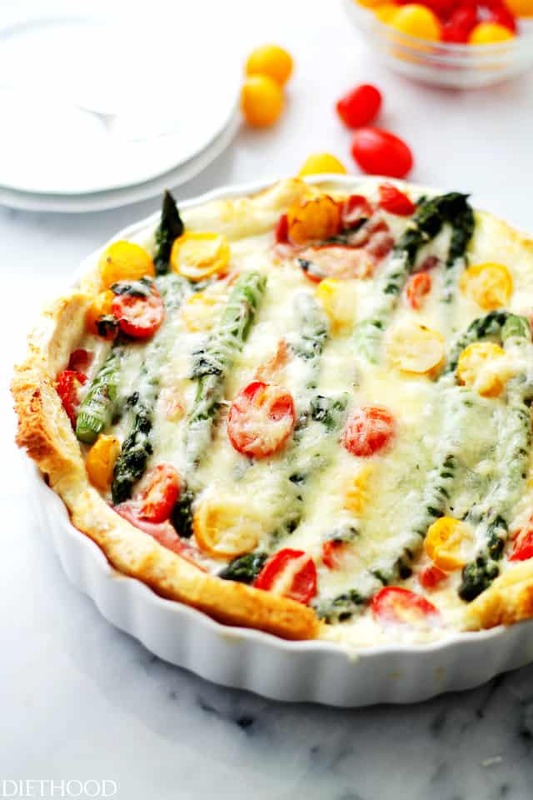 Top with tomatoes and asparagus. Sprinkle cheese over the asparagus and set aside. In a large mixing bowl, combine the eggs and milk; whisk the two until well blended. Season the mixture with salt, pepper and nutmeg; whisk until combined. Cover the casserole with foil and refrigerate it overnight. While preheating oven, remove strata from fridge, uncover and let stand on counter for several minutes. Bake the strata uncovered for 50 to 60 minutes, or until the eggs are cooked and the top is puffed and golden brown. Remove from oven and let stand several minutes before serving. *If liquid mixture does not seem enough for all the ingredients, in a separate bowl, mix one more egg with 1/2 cup milk and add to casserole. Think I’ll try this this weekend. 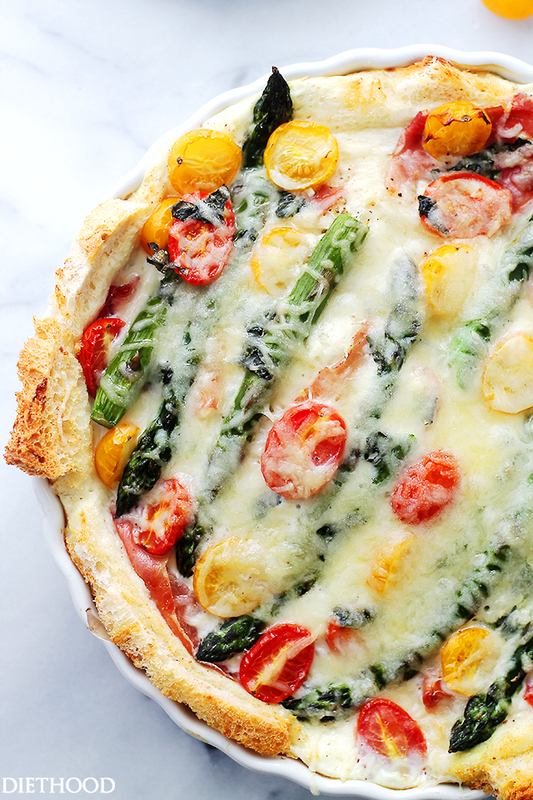 Perfect for asparagus season! Thanks! This is absolutely gorgeous!! 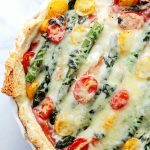 I love finding new ways to use asparagus! A breakfast with color like this is exactly what I need to get me going in the mornings! 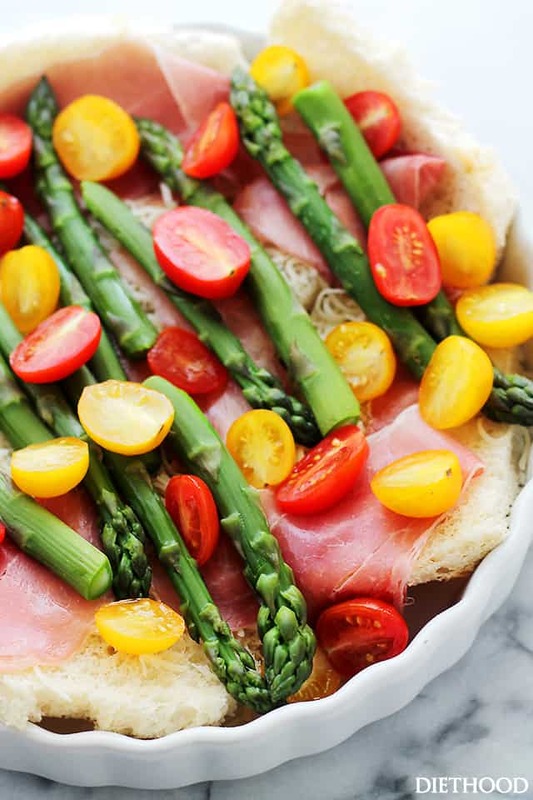 I love the asparagus and tomatoes together! I need this prosciutto strata in my life asap! I love the thought of adding prosciutto and asparagus. I never have before. I would like to eat my screen, thanks. 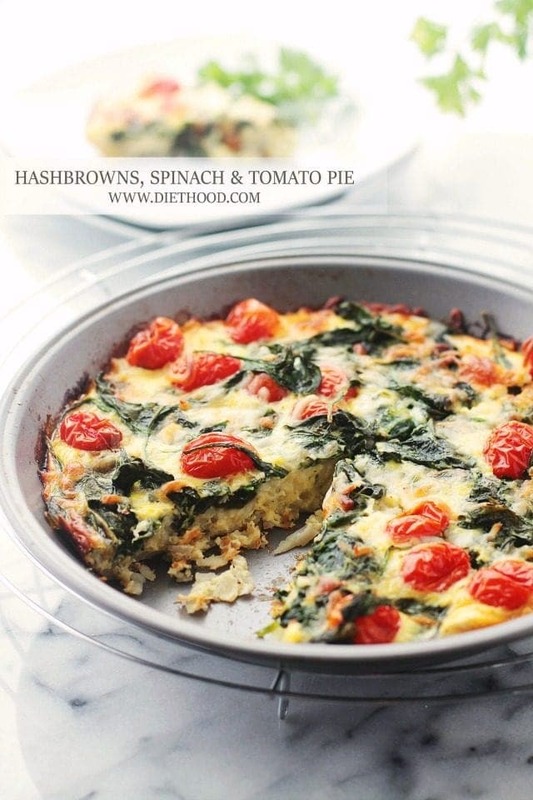 This is beautiful and would be perfect for Easter brunch!! Thank you! This is so pretty. I love eating stratas loaded with goodies like this and the prosciutto just makes it better. Holy cow! This sounds so amazing!! I LOVE this! Yes please, this is my dream Easter meal!